An axiom is a statement or proposition that is regarded as already having been established as true and is considered self-evident. We can be deceived into believing in the accuracy of an idea that is contrary to what actually ‘is’. Once we accept these false axioms we develop barriers towards information presented that is not in keeping with what we already consider to be true. It can become difficult to break down the barrier to recognizing the truth of reality, both within ourselves and in the world without. Self-knowledge is required if we are to no longer be deceived, manipulated, fooled, tricked, duped, conned, scammed, screwed, bamboozled, and hoodwinked into accepting falsehood as truth. We have to understand ourselves more, what is happening in human consciousness, how it functions, what the qualities of consciousness are, how consciousness manifests, and how it has an expression through the physiology. That is fundamentally important to understanding what is taking place in the world. If we look at the etymology for axiom, we can see how important concepts are in our lives. An axiom is related to what we think is worthy, fit, of value, of weight. It comes from the Proto-Indo-European word ‘ag-ty-o‘, with the root ‘ag’ meaning to drive, draw, and move. Axioms are those beliefs that we take into ourselves at a core level that drives us, that draw us in a direction, that move us, they are weighty influences on our lives. 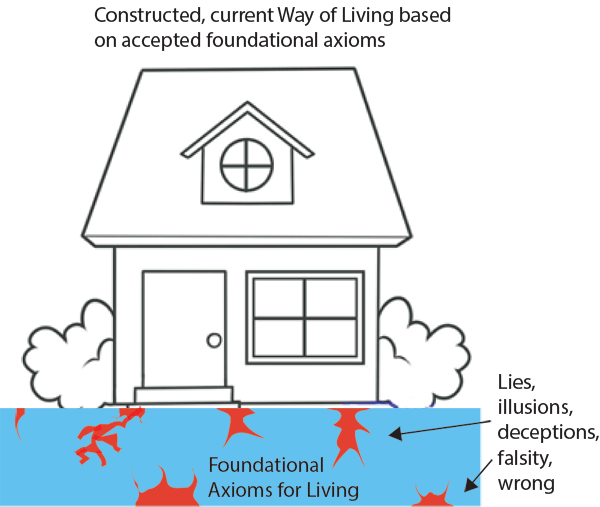 It is important to not be deceived and manipulated into accepting falsities; otherwise the direction we go in may be built upon a flawed foundational understanding. If you take within yourself the axiom that 2+2=5 then your development will be orders of magnitude different than if you were to understand that 2+2=4. The divergence in understanding grows exponentially with the degree of divergence from fundamental axiomatic principles of Truth. Ask someone: “What are 3 things you value above everything else in life, the 3 things you think are the most critical to your life and quality of your life.” You will get a diverse amount of answers such as: family, health, happiness, money, religion, etc. You will probably not get “Truth” or “Principles of Truth” as an answer from many people. People have lost the idea that truth is valuable and that it determines the quality of our experience. That is the reason we are in our current condition/situation. Being in alignment with what ‘is’ (truth, reality) through speaking and living in harmony with the truth of Universal Cosmic Natural Moral Law, generates the quality of experience that manifests as our current condition. The quality and condition of our lives, and the amount of suffering we experience as a whole, is proportional to the degree to which we diverge from the Path of Truth. That is a fundamental Law of Nature. Consider gravity: this is a law of nature. It does not matter whether you believe in it. If you step off a cliff, you are going to experience the result of what the law of gravity will do to the body, whether you believe in it or not. It is irrelevant whether you believe in Natural Law, because it is in place, and you are bound by it. You can choose to ignore Natural Law, but you will suffer proportionately to the degree that you ignore it. We fool ourselves by accepting something that has no basis in actual reality — ideas or propositions that are not true; or we refuse to accept the truth of reality, what ‘is’ in effect and occurring. These are the core reasons that humanity experiences suffering. 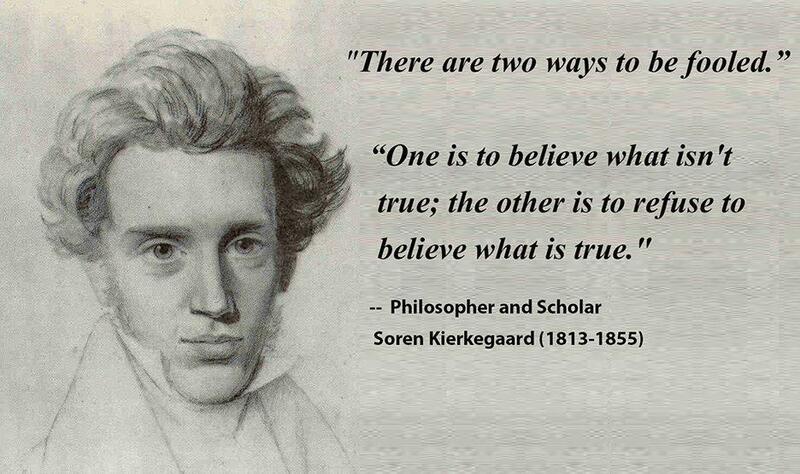 How to determine truth from falsehood is a subject for another time. “What is true is already so. Truth is what ‘is’, that which has undergone the process of occurring in our reality. Events take place in 3D space-time reality. That is what truth is in its most basic sense. It is not the understanding of the mind of “God”, so to speak, or anything abstract that confuses the mind, but simply, events occur. We can come to an understanding of what is actually taking place both within us and around us. I call this Truth Level 1, which is the current reality that is manifested or has been manifested or will be manifested, differentiated from Truth Level 2 which is Truth, Love, Good, Right, Morality, etc. that we need to align ourselves with in our actions to create goodness, rightness, etc. in the world. Our failure to understand truth is the core reason we experience suffering in the world. We have gone off the path of truth, off the spiritual journey. We are engaged in illusion, fantasy, flawed axioms and belief systems which we take as true but are fundamentally not true. Staying attached to false beliefs in illusionary constructs that are not in alignment with what actually ‘is’ (reality, truth – level 1, or with what is right, good and true – level 2) creates the problems and suffering we experience for ourselves and each other. The truth of reality can be expressed from the scientific perspective of quantum mechanics. The waves of potential possibility that emanate from what we call the past have coalesced, condensed, collapsed and become actual events in the present moment. The truth is that which has already undergone the formality of occurring, it happened and is now a part of what ‘is’ as we progress forward in time to new formations of truth that will emerge based on the past manifestations in reality. To discover these truths is another issue apart from recognizing truth exists. Truth is intricately related to the problem of why we experience suffering in our world. We need to understand what truth actually is at a core fundamental level. As we increase our understanding of the truth, we become more consciously aware of the reality that ‘is’ and better able to respond — our ability to respond is our responsibility — to this existence we collectively live in. Through awareness of our reality we can come to develop an increasingly accurate comprehension of various truths and be better able to recognize the nature of the current condition we experience and exist in; to truly understand the root causal factors that are contributing to our collective problems/suffering. With truth we can understand how these problems function and why we see them manifesting in our shared reality. Refusal to admit and acknowledge truth is disunity, disharmony, and a divergence from the reality of what is occurring, which inevitably degrades the human condition. Acceptance and alignment with truth and living in harmony with the principles of Natural Law allows the human experience to flower into something worth participating in. Truth is like light, shining away darkness, dispelling lies and deception that put us in ignorance and self-inflicted suffering. It can be too bright for those who are surrounded in darkness and cause them to look away because of this discomfort. Truth can be uncomfortable, it can hurt, but that is only because one is living in darkness and is not already living in harmony and alignment with the truth. Ultimately, Truth Unites while lies divide. I cannot express the importance of Truth in its fullness; one will come to realize this on their own as they take into themselves more Truth that leads to deeper understanding of reality and themselves. Revealing the symptoms of what is happening in our reality is a necessary component to gain further understanding. Beyond this recognition is the requirement to comprehend deeper relationships that lead to the underlying root causal factors creating the external reality we experience. The most critical causal factor creating our condition is the ability to discern truth from falsehood. Building a foundational conceptual framework is a prerequisite before progressing to other concepts of greater complexity. 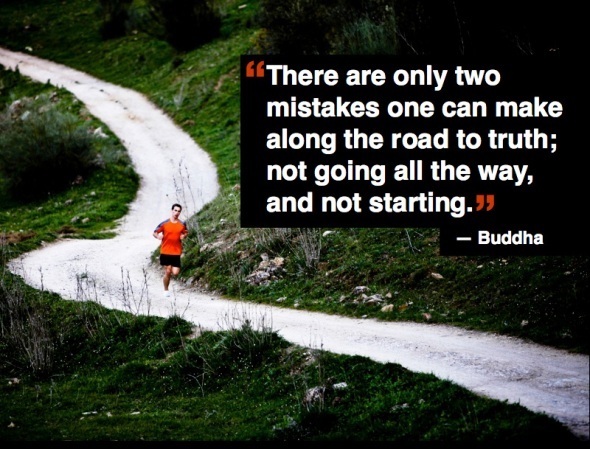 One truth leads to another, but first a beginning foundation of core principles is required. Building a world of freedom and order is only possible through evolving consciousness by coming into greater alignment and harmony with what is happening around us and within us. Disharmony, disunity and non-alignment with the truths of reality lead to a poisoned world view where we don’t know who we are, how we operate, the motives for our behavior, how the mind, psyche and physiology function, which then produces increased confusion, control, fear, disorder and chaos and not a position of intellectual and emotional maturity to understand our condition. 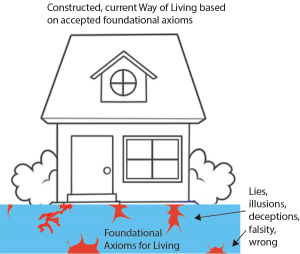 Accepting falsehoods in the place of truth is like building a flawed and faulty foundation for a house. Everything we build is based upon the foundation. Building upon a foundation of falsehoods, deceptions and lies as a result of failure to align and harmonize with truth will create a week and feeble house. It is a house built upon untruth and will require constant Band-Aids in attempts to keep the poor construction standing. The more we build on top of falsehoods, the more we diverge from an accurate understanding. Focusing on temporarily patching-up symptoms and effects without understanding the root causal factors is a failure to understand foundational core principles recognized through alignment with Truth, reality, what ‘is’. Those who manipulate the dynamics of the world, understand this information. They have chosen to take information they recognize is unique, valuable, powerful and not many people have access to, and use it as an advantage to control and manipulate others who put them in positions of power by thinking they have secret information that the others require and make their lives easier at the expense of others. There is another choice to be made upon recognizing this information that has benefited, helped and raised their consciousness, and that is to share this knowledge and understanding with others to help raise their consciousness as well. This is perceiving ourselves in a unified way with others and not wanting to have an advantage over others by manipulating and controlling them. There is recognition of an imbalance between certain levels of conscious awareness and a desire to bring balance to this dynamic by assisting others to attain the understanding necessary to increase conscious awareness and evolve consciousness. There is a sort of game in operation that most are unaware of; not a playful game but a serious game of life. It can be likened in certain respects to a chess game with many different elements of understanding required to become an excellent chess player. Engaging in a game requires an understanding of how the game functions. This is equivalent to Universal Cosmic Natural Law, the way in which the system we exist in operates. There are Laws in operation that we are bound to regardless of a wish to believe or accept them. Going against and breaking these Laws increases suffering. Harmonizing, uniting and aligning with these Laws decreases suffering. A skilled chess player also understands qualities of the opponent, such as how much they understand the game, what strategies they know, what their drives and motivations are, and what they’re thinking. Understanding what the opponent wants to do permits planning several steps ahead. With this knowledge, a sense of timing develops wherein certain specific sequences of moves are preferable to others. There is a sense of duty to be willing to do whatever is needed, even to sacrifice pieces. Dark occultists sacrifice human lives in a similar manner in order to advance their agenda in this game. While the dark occultists understand how things function, most people do not even know there is a game being played and haven’t shown up to play of their own will and conscious awareness. Most people are currently letting themselves be played as pawns in the game, as cogs in a wheel, running a program, a conditioning of belief constructs, with strings tied to them, with their direction in life guided by limited choices as wanderers on that checkered floor, whether they are aware of it or not. We need to liken ourselves to the position of a chess master who is not a piece on the gameboard floor, but one who is above the board and engaging from a higher perspective. The Chessmaster or dark occultist moves the pieces at his will, while the pieces or people never see the strings that tie them down and never recognize they are pawns in a predetermined limited path towards an end they don’t see. To be on the checkered floor as a piece of any degree (pawns, rook, etc.) limits the level of consciousness. From this level of conscious awareness, vision is limited to one or two squares, lacking the perspective of the whole game. A piece on the board is positioned at the will of another who operates from a higher vantage point to perceive and understand the operations of the game or life. The big picture can be understood, but not from the pieces to be assumed on the checkerboard floor or trying to fit everything into boxes, because the truth does not fit into one or more boxes. Perceiving the truth can be impeded by attempting to fit things into preconceived and potentially false ways of looking at reality and ourselves. 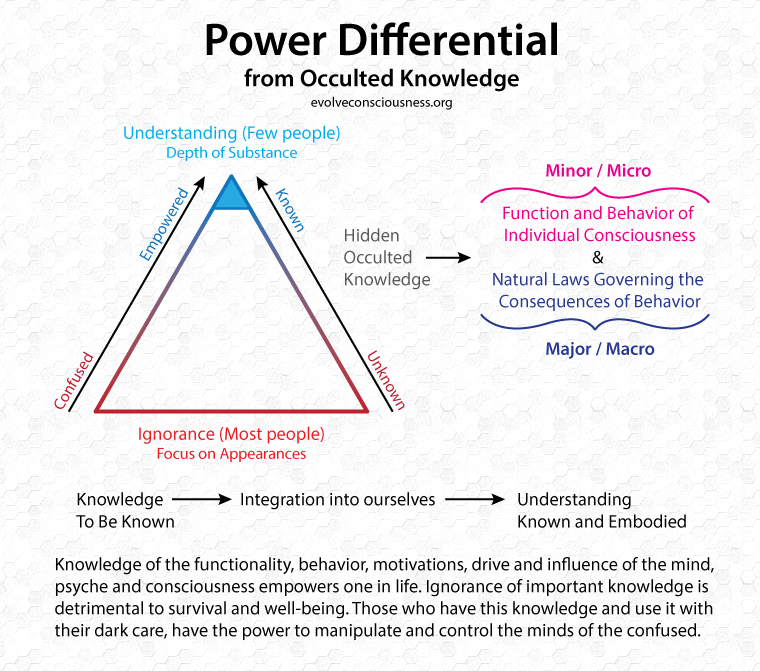 The dark occultists, dominators and controllers in power understand many aspects of objective truth, the bigger picture and foundational principles, and are successfully keeping this knowledge from everyone. Our minds are kept in a rat maze or hamster wheel of preoccupations to avoid looking at consciousness, and specifically the negative aspects, to understand how and why the current self-inflicted condition of control and suffering is being created by each of us through the manifestations of our consciousness, especially in the form of actions, behaviors and habits. To know thyself is part of philosophy which is the love of wisdom. Wisdom is not simply knowledge, but acting on our knowledge and living a certain way, in right-action based on truth. True philosophy is based in truth and determines our conduct in life. A way of living not based in truth is not a philosophy but an ideology. The love of wisdom in order to behave and conduct our lives in a way that is conducive to producing goodness, is what drives all other disciplines of understanding such as alchemy, Kabbalah, astrology, Tarot, Freemasonry, etc. The search for truth and understanding is also a search for answering the question “who are you?” What we do, how we act and behave as we manifest our consciousness is a part of who we are. Wisdom is doing something with what you know. There is a difference between knowledge and understanding, and properly applying that knowledge and understanding. 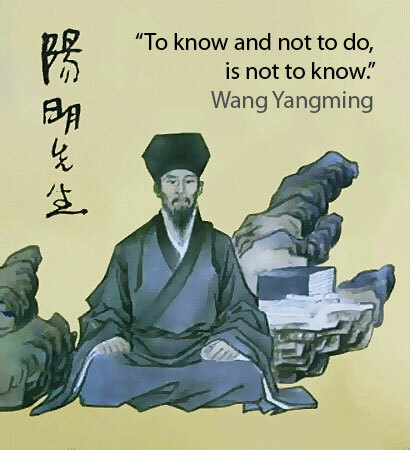 The application of knowledge is action. Knowledge must be unified with action at some point in order for something to result from that understanding. Otherwise, it is just an understanding that leads to nothing. Nothing will end up changing, as action through will is required for things to change. This change can be internal as well as external, but action needs to be applied with knowledge and understanding. Having accurate understanding of what ‘is’ in reality is the first step. Knowledge and understanding is not power in itself. Right-action chosen, aligned, decided and determined by accurate understanding imbues that knowledge with power. Once we know, what are we going to do with what we know? Right action is knowing and understanding properly first and then acting upon it. You can act from a position of lack of knowledge and understanding and hope to get the results you want, but since you don’t know enough about the situation to produce the results you want instead of the results you’re getting, then acting from a position of ignorance is not likely to produce something we really want. Only by understanding the core foundational root causal factors can we come to a position of accurate understanding in order to apply proper solutions. Aligning with Natural Law and truth will provide us with the right action to take. “Under analysis a person discovers that situations consist of elements, some of which are wrong and others right. If he sorts out and examines those elements, truth is easily separated from error. Some tasks of sorting are more difficult than others, but only because they are more complicated. They have more elements; therefore, they take more time to analyze, or perhaps the individual lacks knowledge of how to deal with them. Knowledge and understanding can be used irresponsibly to spread deception and keep people ignorant and under control, or it can be used for good to elevate, expand and evolve consciousness. Accepting the concept that there is negative information prevents one from embracing the truth in all its beauty and horror, light and dark, good and bad. Refusing to look at the shadow, darkness, demon and negative that dwells inside of each of us (consciousness, psyche, mind and heart), will halt the spiritual journey and path towards truth and prevent us from getting to the “heart of the matter.” The only way out of the problems we have created is by confronting them, and in the end, the source is each of us. Knowing ourselves by looking in the mirror into the heart of darkness allows us to face that which needs to be transmuted, sublimated, transformed, healed or purified. Turning our backs to the hard uncomfortable truths is not the solution. The spiritual journey is the path towards truth. Caring enough about truth to seek it out and evolve consciousness through this conscious awareness that truth brings. The first initial awakening is brought about by a catalyst that brings care to a certain level. The care manifests as wanting to know more about what is happening. Going from the state of not-caring to caring is beginning our spiritual journey, the path towards truth. Caring fans the little dormant flame and spark in each of us and allows us to grow. From a state of ignorance and apathy, care will revive and resurrect the dead condition of mind and heart. Care takes the dead, the unbegun, the uninitiated, and initiates, begins, awakens, arises, revives, resurrects onto the spiritual journey and path of truth to evolve consciousness. At times, care diminishes and so does the journey and path to seek truth. This enables ignorance and apathy to creep back in and kills action. Instead of courage and will, action is dead and in the grave replaced by laziness and cowardliness. Anytime we think we are done the journey, seeking, or have learned enough, we have chosen to stop along the path towards evolving consciousness, we have decided to camp out at a certain level of consciousness and be content not to climb higher. This is going back in the grave, stepping of the path, off the journey. Stopping along the journey and not beginning the journey are the two mistakes everyone makes towards evolving consciousness and finding solutions to our problems. The spiritual path towards truth leads to greater knowledge, care, courage and will to act in the world and create the experience we want to be having instead of the suffering we are currently manifesting. The journey and path is mostly (not fully) an inward journey within. Walking the path to understanding truth about ourselves will enable us to understand truths about the world we live in and how we are creating it. Know thyself, self-knowledge, self-awakening, self-realization, self-awareness, self-dominion, etc. are the same goals on the quest, journey and path towards evolving consciousness. To know ourselves we must face ourselves in the mirror, in honesty and self-respect without fear of looking at the beauty and the horror, the light and the dark, the good and the bad within us and in the world around us. Looking at the shadow, demon, dark, negative side of ourselves and the world can be hard to confront. Truth can be hard to hear, let alone accept, and make us feel very uncomfortable. This discomfort is our compass telling us something is wrong. Fear, discomfort, and hurt can come with truth, but it will lead to healing for the better. Not facing the truth in fear, avoidance and denial brings more suffering. Recognizing and accepting our current condition is the only way forward. With that awareness we can develop the care, courage and will to choose to change ourselves away from those things we recognize to be against our betterment. Taking the negative shadow and transmuting or purifying it as a phoenix is burned and is reborn from its ashes so shall we be reconstituted in a new form, reborn anew with the aspects of our being we do not want, and to have them removed, changed , healed, bettered, improved. Keeping rosy-colored glasses on is not the solution. Rosy-colored glasses prevent us from seeing reality, what ‘is’, the truth. Instead, rosy-colored glasses have one seeing everything as great, as perfect, because they are only looking at what is pleasant for them to look at. They don’t want to see things as they are because the truth can hurt and make them uncomfortable. Rosy-colored glasses prevent us from seeing the aspects of the world and ourselves that are not helping us, that are keeping us in chains of self-inflicted suffering. Only true awareness of self and the external world can bring solutions to our problems. Seeing with rosy-colored glasses is based in fear, avoidance and denial. Using rosy-colored glasses means consciousness has not developed to a point of conscious awareness enough to recognize the importance of truth and of doing the inner-work. As long as our focus is on feeling-good through avoidance and denial, we will not face the truth and not grow, change, or evolve towards what we want to be, to create the world we want to see. Reinforcing this refusal to recognize truth and change in alignment, unity and harmony with truth is our ego defense mechanisms that don’t want to change the self-concept we have based on lies we tell ourselves to make us feel-good about our choices, decisions, actions and behaviors. We want to desperately believe we are a “good person” that we dismiss, deflect, diminish or outright deny truths that we don’t want to face, that make us feel uncomfortable or bad. It is much easier to ignore the hard truth and reality than it is to face it, accept it and then align ourselves with it. Time, effort and energy are required, but people do not want to do this work. Living in the comfort of lies is much easier to deal with, as we simply continue doing what we are already doing, without the need to change, grow, improve, evolve, heal or better ourselves and the conditions we live in. The finger needs to point inward and the blame placed upon each of us for what we have created, not more excuses, justifications, and defensive rationalizations. The solution to get out of our self-created problems is to recognize, align and unite with truth, not more self-deception and self-delusion through lies to maintain illusory self-concepts. We can come to reach, grasp, attain, know and understand greater degrees and aspects of Truth, increasing the probability of certainty through pattern recognition and correspondence to interconnect various aspects of reality into a cohesive, coherent, integrated web, field or pattern. How are some of the ways we fail to recognize truth? Solipsism is the main anti-truth mind-virus that halts the spiritual journey which is the path towards what is right, good and true.